Since the national People’s Assembly Against Austerity held in central London in June, People’s Assemblies have sprung up all across the country and thousands have attended meetings held by this fledgling movement. As the cuts bite and nasty policies like the Bedroom Tax and forcing disabled people into work expose the cruelty and perniciousness of this government there is clearly a mood to mobilise large numbers of people with a clear ‘no cuts’ message. All the major trade unions in Britain support the People’s Assembly Against Austerity and the Trade Union Congress (TUC) formally passed their support for the project at their recent conference. 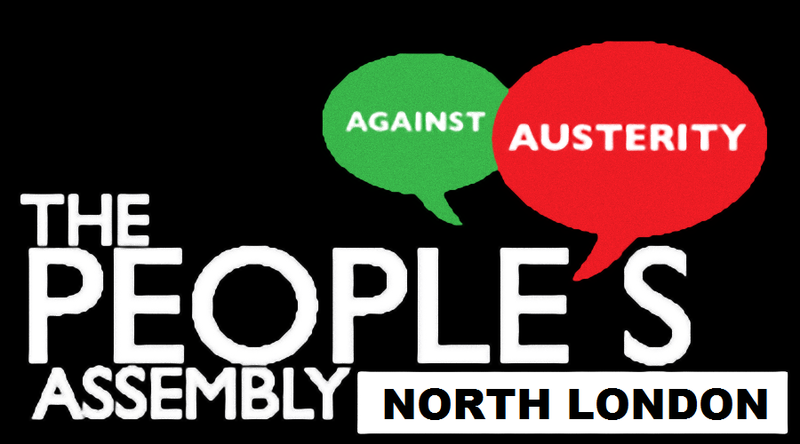 Campaigners, trades unionists, MPs and many local organisations are participating in a North London People’s Assembly on 26 October this year. This event will send a clear message that North London opposes austerity and will decide on a plan of action to support national People’s Assembly events. To help promote the event please email northlondonassembly@gmail.com. We need YOU to help us build a movement that can tell this government of millionaires that we do not accept any of their cuts and will tirelessly campaign to overturn these disastrous measures. See you in October.